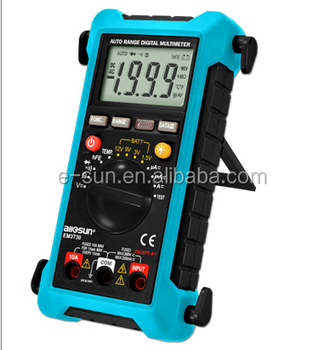 This meter is a compact 3 1/2 digits digital multimeter designed to measure DC and AC voltage ,DC and AC current, resistance, temperature, diode, transistor, continuity and battery.In addition,non-contact ac voltage detection function and live ac wire detection function are also provied .It features polarity indication , data hold and automatic power-off . It is easy to operate and is a useful test tool. Test lead support is used to twine test leads line and prevent it from loosening . In addition , you can adjust test lead support up and down to a satisfied angle when you see test leads.